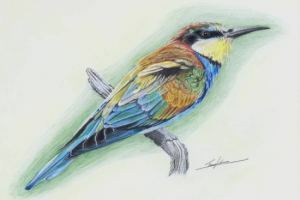 A collection of my artwork and photography of the birds of Australia, New Zealand, Switzerland and Britain (and a few other places inbetween). The site also has trip reports of a few of my birding adventures (bobbing around on the South Pacific looking for seabirds for eight hours is quite fun!). Each species page has photos and a description, made from a mixture of knowledge learnt from field guides and personal experience. The site is constantly changing as I get photographs of new birds and update old pages. New birding guide out now! 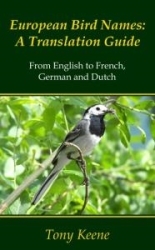 Check out my book European Bird Names: A Translation Guide, a field guide to translating bird names from English into French, German and Dutch. Covering all but the least-common WP birds, it is designed to complement one of the most popular birding field guides. The English text is based on the BOU list, while the French and Dutch follow the official lists of the LPO and CSNA, respectively. The German list is derived from official lists of the DO-G and other sources where more commonly used. Taxonomically up-to-date and highlighting differences between national opinions on splits and lumps plus potential problems with the German names. Perfect for the travelling birdwatcher! 30/11/2014: 3 new pages of sketches. 12/10/2014: British birds section updated. 24/12/2012: 12 new and 6 updated in Australian Birds, the last update from Australia. 21/10/2012: 1 new and 3 updated in Australian Birds, 1 new in Birds Elsewhere from Spain (Audouin's Gull) and a new trip report from Greenfields Wetlands, Adelaide. I've finally updated the British birds section with new pages, species and photos. Not only have I moved country from Australia back to UK, but we've moved webhost as well. There's a couple of pages that need some updating to work properly, but I'm working on it slowly over Christmas. I've made a taxonomically-ordered list of the photo pages of birds on the site, so it's possible to see related birds without hopping between country pages. The list uses the IOC World Bird Names list 2.8.